Gimmie a Cold Bottle of Goon! Dark Horse Comics, known for breaking tradition and bucking trends, is excited to announce the company’s participation in the Jones Limited program at www.myjones.com with the like-minded soda maker, Jones Soda Co.
As part of this program, fans of comics and soda alike will be able to purchase collectible-themed bottles featuring some of their favorite Dark Horse characters and art. One hundred numbered and limited six-pack bottles will be available just in time for Halloween on October 7th. 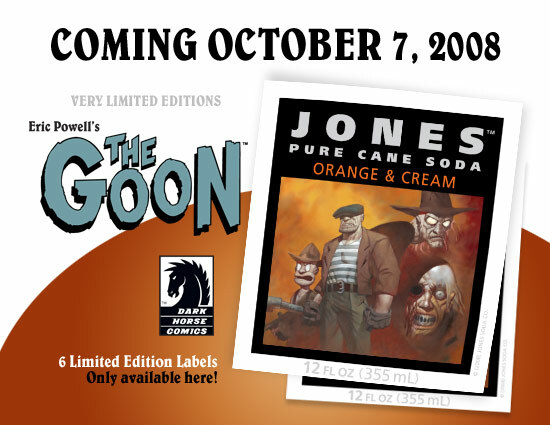 The program will launch with Eric Powell’s The Goon, and the iconic thirteen-year-old Emily the Strange, and will only be available at www.myjones.com. The Goon will be available on October 7 and Emily the Strange limited-edition bottles will arrive on October 14th. MyJones was developed to create a unique and personal connection with Jones consumers by allowing them to customize their own bottles. In 2002, Jones Soda received the patent for the unique MyJones process, and the service continues to be one of the most popular features that Jones Soda offers today.